So for my brother’s birthday I made this quick, but luxurious and simple brunch/breakfast for him. If you want to make someone feel special, but don’t really have the time to do it, I highly recommend this recipe. This is adapted from Ina Garten (via Chrissy Teigan), so again it will be Y-U-M-M-Y! Set the oven rack 6 inches from the broiler and preheat the oven on broil for 5 minutes. Combine garlic, thyme, rosemary, and parmesan in a bowl and set aside. Set out 4 cups/small bowls, and crack two eggs in each bowl, being careful not to break the yolk (otherwise you’ll have baked scrambled eggs). Add salt and pepper to eggs. Take 4 individual serving sized baking dishes and place on a cookie sheet (make sure the dish is broiler safe!!!). Put a tablespoon of cream and 1/2 tablespoon of butter into each baking dish. Place under the broiler for 3 minutes, or until the cream and butter are hot and bubbly. Take out of the oven, add the 2 eggs, and sprinkle the herb mixture on top. Place back under the broiler for 5 to 6 minutes, until the egg whites are almost cooked. 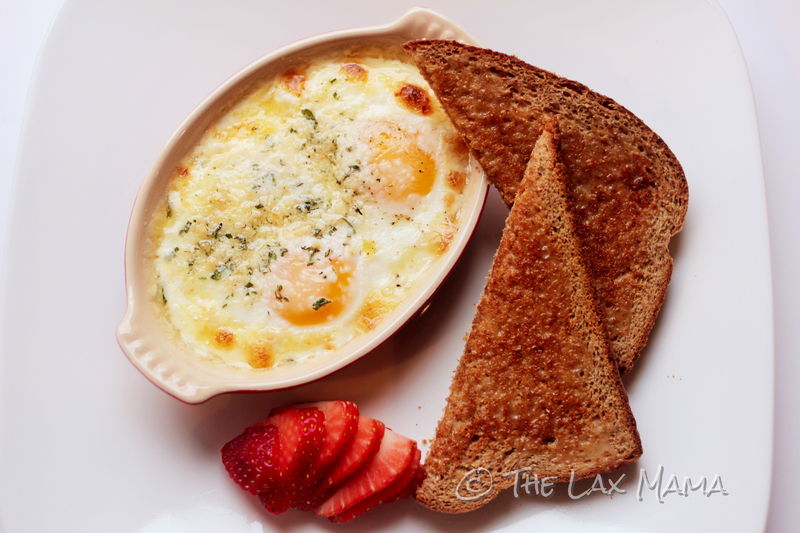 Take out of the oven and let the eggs set for a minute before serving with buttered toast. So the original recipe calls for 3 eggs, but my gratin dishes were definitely too small for 3 eggs. If you have dishes that are a bit bigger, definitely go for 3 eggs. I thought 2 eggs was more than enough for us and it also meant the eggs were creamier and herby. The recipe also calls for fresh parsley. We didn’t have fresh parsley in the house, so I omitted it from this recipe. However, if we did have parsley I think I would have added it after the eggs were cooked in the broiler. It was fine without the parsley too. If you don’t have fresh herbs, you can use dried herbs but definitely use a 1/3 of what the recipe calls for since dried herbs are more potent. This recipe is also for 4 people. My brother and I like our eggs a little runny, so I pulled out two dishes at around 6 minutes. If you like your yolks more firm, keep the eggs under the broiler for a few more minutes. As long as your eggs are 6 inches away from the broiler, I find that it won’t completely burn if you choose to have a firmer egg. But remember that when you pull the eggs out, it’s still cooking a bit when it sets up.